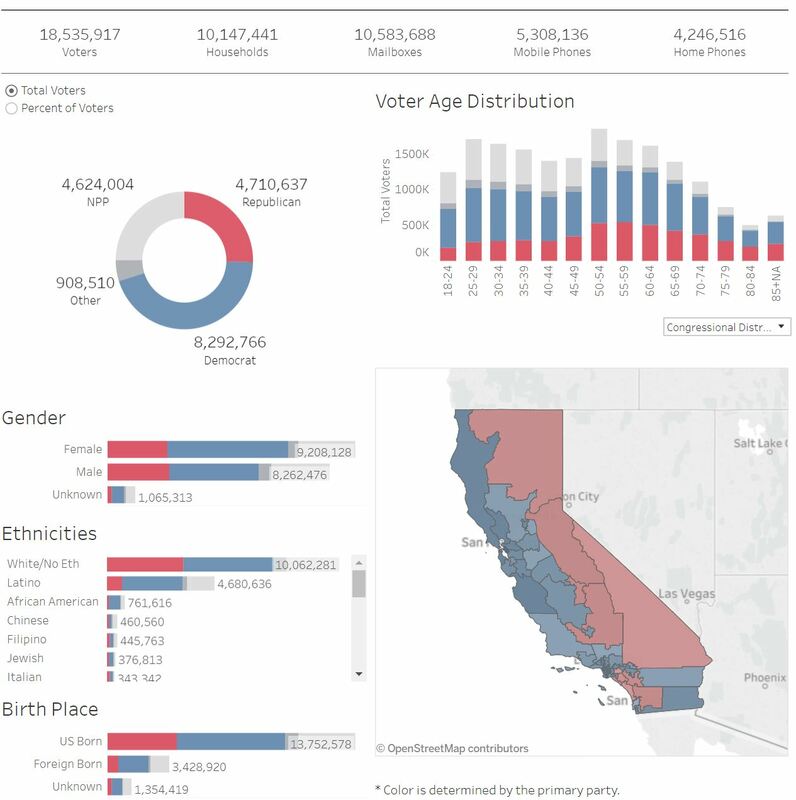 Three quick highlights of your PDI data | Political Data, Inc.
As a PDI user, you know innately that the data you’re using is the best available. Here are three things about the data this year that should be conversation pieces for the most nerdy political consultants, candidates and staff. The PDI Data is fresher than any other data source in the country. We have finished our 30-day close file, obtaining files directly from counties to provide access to more voters, and the best current address, phone and email information available. Currently the state has 18.5 million voters, with 8.2 million Democrats, 4.7 million Republicans and 5.5 million Independents and others. We had massive voter registration in 2016, but also a surprisingly high rate of registration since then. And we don’t stop there. We are already preparing for the 15-day close of registration and obtaining all the latest data we can get for our clients. One of the less-known processes in PDI has to do with our ability to append vote history to registrations that each county views as a “new” voter registration. Like in other states, the county is the level of government that manages elections. However, counties haven’t historically done a great job at communicating with each other – so if you move from Los Angeles to Sacramento, your new registration shows no prior vote history. You’re a “new” Voter. However, at PDI this isn’t good enough. We know that new registrants have different voting likelihood than those with rich prior vote history. There are also other factors that might get lost in a past registration – like the voter’s prior party registration, if they have pulled a partisan ballot in an open primary election, or any other important flags. Our cross-county append process allows us to bridge all new registrations to a database that goes back 20 years, and includes more than 40 million voter registrations and get that historic data for our clients. How big of a deal is this? In January we did a cross-county append for the 2017 registrations and added 5 million votes cast in prior elections – adding them to voter records that were, until then, looking like “new” registrants. As a result, our likely voter universes are looking at a more fully developed picture of each voter, where someone working in another file doesn’t have access to this information. The state currently has a record 11 million absentee ballots in the hands of California voters. But, we also have a record high number of voters who could be voting by mail for the first time. As is discussed in this article, a number of election reforms are taking place this cycle, including the transition of Sacramento and San Mateo (two rather large counties) to a fully vote-by mail system with ballot drop-offs and vote centers. In addition, roughly two-thirds of the more than 2-million registrants since the 2016 General have selected to be Vote By Mail. This has significantly changed the composition of by-mail voters. Instead of being mostly older and conservative voters, they now include a massive influx of newer registrants – younger, more diverse, and more likely to be renters or move regularly. To make this data usable to customers, we have created a set of early/late voter flags that are the first in the industry – no other vendor has this kind of data on absentee ballot returns. With this data you can actually target your spending to allocate more resources to early voters now, and reserve more firepower for those late absentees and poll voters. We work year-round so you can be most effective in this last few weeks of the election. And right now is when the fruit of that labor really can be appreciated.